Text: The cinema was my church and academy. From about the age of four I went at least twice a week. In those days of double features I must have seen over two hundred films a year. It was the kind of thriftlessness that made Grandma Osborne and her tribe swear as indignantly as she did about the Welsh miners at home throwing legs of mutton to their whippets. When the insurance man, the clothing-club man or the milkman called and my mother was hiding in the bedroom, I would often as not be sent to the front door to mumble, ‘Mum’s out’; but she could always lay hands on Money for the Pictures – the mainstay cultural benefit of a generation of children from similar backgrounds to my own. Pictures Places, and Grandma Grove still called them, were aptly named. The warm luxury of Eastern or Egyptian Art Deco, the ascension of the cinema’s organist like a matey angel, were preferable to a cold room with a mantelshelf lined with unpaid bills from doctors, coalmen and the Gas Light and Coke Company. To the profligate poor or near-poor, the priority of the Picture Palace was an unanswerable case. Hollywood bit-players, now known by name only to cineastes, the elevator boys, gangsters, cab-drivers, bar-tenders, cops, butlers, Italian chefs and foreign counts were, I suppose, as real to us then as the characters of Coronation Street today. The difference lay in the kind of familiarity. For one thing, it was unmistakably foreign and beyond our reach. We had to learn to translate intuitively what Confederate money was, a sawbuck or even a hundred bucks, converts a dime or a nickel into something comparable, or the meaning of being behind the eight-ball, taking a rain-check or over and easy. These were elementary steps but they had to be mastered at an age when the grasp on your own language and birthplace was meagre enough. But foreign, and specifically American, their very strangeness made the dreams of Hollywood accessible and open to identification and fantasy in a way that home-grown films were not. Surely few Coronation Street diehards could want to live there. The luxury and privilege of, say, living in Manhattan held more promise of imaginative fulfilment than the more familiar but remote English equivalents. The American model was unreal but attainable. A world of large gardens, tennis parties, housemaids, college scouts and Inns of Court might seem pleasant and comfortable enough but there was little impulse or point of dreaming yourself into it. You would watch it from without but never enter it even if you were inclined. What was not unimaginable or close to you was Eric Blore opening the door, having William Powell recover your wife’s jewellery for you, being made vice-president of a corporation by your father-in-law, Edward Arnold or Eugene Palette, handing your topper to the hat-check girl at the Stork Club as you escorted Carole Lombard or even, at a pinch, Gail Patrick into dinner, wearing a black shirt and white tie and black pin-stripe with a white carnation like Dan Duryea, or maybe taking a cab driven by Frank Jenkins to Penn Station. There was no need to have passed your Common Entrance, let alone have been to Eton or Oxford. It was available, to be admired, envied and even coveted, and most of all to those of us in the front seats who had sneaked in through a carelessly unbarred exit door. Madeleine Carroll was my earliest favourite star, but then there were scores, year after year, only enriching each other. Robert Donat reminded me of my father, although they were unalike. I saw Thirty-Nine Steps whenever I could and there was a time when I knew the dialogue of The Four Feathers and The Prisoner of Zenda by heart. 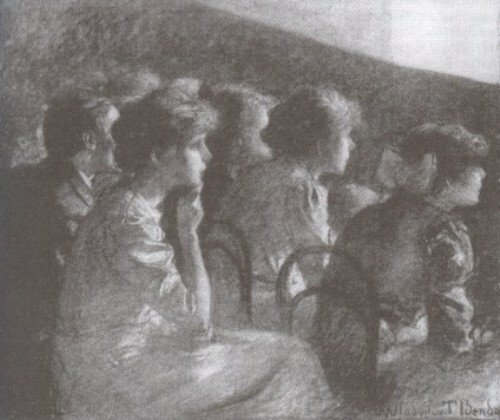 The Rembrandt Cinema in Ewell was almost always full every evening during the war. On Fridays and Saturdays there was certain to be a queue. A Bette Davis film was almost impossible to get into all the week. even Grandma Osborne was known to leave the Warwick Deeping for the afternoon and walk a hundred unaided yards to the Rembrandt to see Now Voyager or Mr Skeffington. I can only remember one occasion when the Rembrandt was almost empty the whole week – apart from Mondays, which were unpopular. The word of mouth about the film showing around Ewell and Stoneleigh was resentful and indignant. In the Parades and saloon bars, there was talk of Speaking to the Manager, even of Writing to the Film People themselves. Later in the week, undeterred by those who said we were wasting our pocket money, Mickey and I went to see Citizen Kane. We came out afterwards from looming Gothic darkness into the bright Kingston Road, silent, uncomprehending and deeply depressed. At tea the Walls asked if we had tummy ache. It had been nothing, even for two such eleven-year-olds as we were, to giggle about. Comments: John Osborne (1929-1994) was a British playwright and screenwriter. His childhood was spent at Stoneleigh in the borough of Epsom and Ewell in Surrey. The films he mentions are The 39 Steps (UK 1935), The Four Feathers (UK 1939), The Prisoner of Zenda (SA 1937), Now Voyager (USA 1942), Mr Skeffington (USA 1944) and Citizen Kane (USA 1941). Coronation Street is a British television soap opera set in working class Salford. The Rembrandt Cinema in Ewell opened in 1938 and closed in 1998. This entry was posted in 1930s, 1940s, Memoirs, United Kingdom and tagged American films, British films, Children, Cinemas, Citizen Kane (1941), Dark, Decor, Ewell, Hollywood, John Osborne, Mr Skeffington (1944), Musicians, Now Voyager (1942), Organs, Parents, Performers, The 39 Steps (1935), The Four Feathers (1939), The Prisoner of Zenda (1937). Bookmark the permalink.